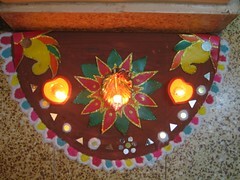 A few photos from our Diwali Celebrations. 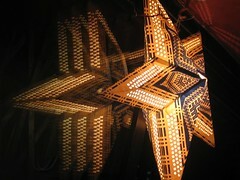 The star lantern is my favourite. I love the way I was able to get the reflection. 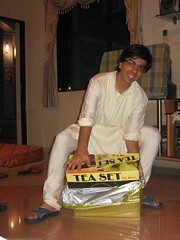 Diwali gets even more exciting depending on the number of gifts which come to your house. This year I decided to get kiddy and opened up all the gifts at home. Nothing exciting for me but the ladies seemed to like the stuff which came in. While on gifting I remembered the lovely Cadbury Celebrations – Tohfa ad which was recently aired a little before Diwali just to remind people that how personalized gifts mean a lot. 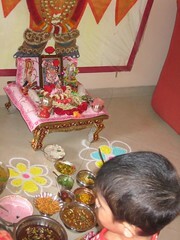 Around the Diwali time we also celebrate a little ritual called “ankut“. This is another version of “chappan bhog” which means 56 dishes are prepared and served to the lord that afternoon. You end up eating a lot and by the end of it your stomach has no place for even a glass of water to end the meal. There is a complete meal of rice, kadi, dahi, papad, mithais, fried wafers, sharbat, kheerni and a lot of other nuggets.